lemon meringue pie is in my top 3 favorite pies — after rhubarb and gooseberry (do i like tart things? apparently) — and this pie gets its name from its absurdly tall meringue topping. Pulse in a food processor the flour and salt. add the cubed butter and shortening and pulse once or twice. add the cold water in and pulse to combine – the mixture should be uneven, with chunks of butter in among the smaller ones. Divide the dough in half, and gather each half into a rough disk. Wrap in plastic, and chill for 30 minutes, or up to overnight. Preheat the oven to 375. Remove the crust from the refrigerator or freezer, leaving it wrapped. Measure the bottom diameter of your pie pan, and up the sides of your pie pan. If your pan is 7″ across the bottom, and 1 ½” up each side, that’s a total of 10″. To account for crimping the edges, roll 11″ out and then trim the edges. Place the crust on a floured work surface, using a silicone rolling mat to be extra-precise. Roll it to the desired width and place in the pie pan. Blind bake the pie crust. Line the pie shell with parchment paper and fill with beans or pie weights. Bake the crust for 15 min, remove the paper and weights, then bake until the crust is golden brown. Set aside to cool completely. 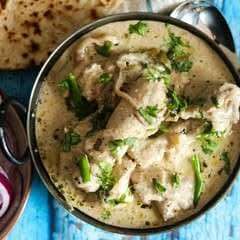 In a medium saucepan, combine cornstarch, sugar, zest, salt, and water. Cook over medium heat, stirring constantly, until bubbling and thick – it will also shift in color from cloudy to more clear, which will take about 6-7 minutes. really keep an eye on it and stir a lot!! – burnt curd is heartbreaking. Remove from heat and stir in lemon juice, then add butter 1T at a time. Let the curd cool for about 10 min. Pour curd into prepared crust and place plastic wrap directly on the surface. Refrigerate until curd is firm – at least 6 hours, overnight to be safe. When you are ready to serve, prepare meringue topping below. With an electric mixer on medium speed, whisk egg whites and cream of tartar until foamy. Gradually add sugar, increase speed to high and whisk until glossy and forms stiff peaks, stir in the vanilla. Spoon meringue onto the surface of the pie until it reaches the crust, then use a spatula to create a swirly, peaked pattern. 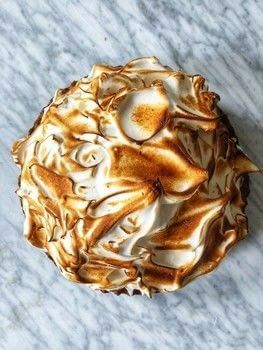 Toast the meringue with a kitchen torch! or under the broiler for about 30-40 seconds.